Jazz pianist Joe Albani, who went by the name of Joe Albany, died in 1988 at the age of 64. Albany spent most of his adult life as a musician and heroin addict, not always in that order. No slouch wannabe, Albany established his reputation playing with such greats as Charlie Parker and Miles Davis. That alone might have made for a good movie. But Low Down, which only touches on Albany’s jazz life, turns out to be another kind endeavor, one that focuses on Joe’s faltering attempts at fatherhood. Based on a memoir by his daughter, who also had a hand in writing the screenplay, Low Down introduces us to Albany during the 1970s. At the time, he was living a marginal life in the kind of seedy Los Angeles dives that writer Charles Bukowski memorialized, single-room occupancy hotels where the clientele was sometimes too drunk or stoned to notice much of anything. 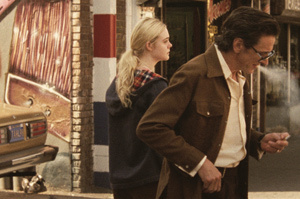 Director Jeff Preiss, who worked as the cinematographer on the Chet Baker documentary Let’s Get Lost, tells the story through the eyes of Albany’s 13-year-old daughter Amy (Elle Fanning). Albany — played by John Hawkes — bobs in and out of the story, sometimes sober, sometimes not. At times, he allows heroin to disconnect him from music, yet we never doubt his seriousness as an artist. Hawkes (The Sessions, Martha Marcy May Marlene and Winter’s Bone) is too good an actor to serve up a series of junkie cliches. He gives us a father who’s gentle and bright with his daughter and who’s imbued with a kind of tolerance for himself and others. Joe obviously has little idea about how to be a father, but he leaves no doubt that he loves his daughter, and Fanning does justice to a teenager who’s trying not to be overwhelmed by her father’s indulgences or by an alcoholic mother (Lena Headley), made viperous by booze and bitterness. Obviously, Amy isn’t living a normal teen life; she’s exposed to prostitutes and to a strange but gentle fellow (Peter Dinklage) who lives in the basement of the dump where her dad crashes. If there’s a surprising performance here, it’s given by Glenn Close, who plays Joe’s mother and Amy’s grandmother, a tough woman who chain smokes, takes no guff, and takes care of her granddaughter when her father can’t. She appreciates her son’s talent, but fears for him. Fanning observes her father, his friends and the life he’s fallen into with baffled curiosity, and Hawkes can feel almost airborne as Joe floats through some awfully dreary days. The movie floats a bit as well; it’s steeped in a kind of ’70s filmmaking style in which the truth of every scene often takes precedence over any narrative arc. I don’t know what else to say to give you an idea about this movie, but it might help if I conjectured a bit. I think John Cassavetes would have liked and admired Low Down — at least, I hope he would have.